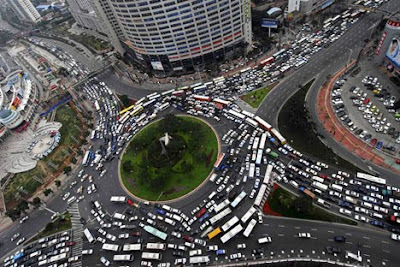 Traffic flow is a strange phenomenon. The complex interaction of drivers results in strange emergent behaviour, such as snarled up traffic even in what seem like ideal driving conditions. A microsimulation is a modelling technique that models individual units. Microsimulations are used for a number of items, including health sciences, pedestian modeling and traffic simulation. My simple traffic microsimulation is based on a simple car-following model. If there's nothing nearby, drivers keep a constant speed. Seeing a car ahead, drivers have the irresitable urge to catch up with them, and thus put their foot down. Seeing a car ahead that's a little too close, drivers slam their brakes on. Overtaking is strictly prohibited! This is a deliberately simple model, just to see if the behaviour emerges; there's a number of much sophisticated models available such as Gipps' or Intelligent Driver Model. The simplest model I could think of is a giant round-about. Cars circle the roundabout as fast as possible, assuming the basic model described above. This results in a nice traffic shockwave much like the one shown in the video below. The main data types are shown below and are (hopefully?) self-explanatory. Rather than store the position of a car directly, I just store the distance to destination. This makes placing the car and determing the distance between them considerably simpler. I've used an infinite list of randomness to provide a source of noise to the simulation. The actual logic of the simulation is equally simple. All we have to do is reposition the cars based on their speed. I've made lots of simplifying assumptions. For example, I'm only considering cars on the same route as being near and I'm not allowing cars to overtake. Putting this together with some OpenGL code gives the following. The full code for this is on my GitHub page and (as always!) any suggestions on how to improve the code are greatly received! I have a sneaking suspicion I should be using a State monad somewhere in here, but it's not quite clicked how yet! I updated the code in the gist with the corrections that Edward Kmett kindly provide. Much better looking results now, though my screen capturing skills still lead a little to be desired. If you download the code you can now change the speed / number of cars interactively and see what happens.